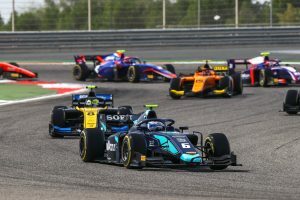 Nicholas Latifi capped a strong opening round to the 2019 FIA Formula 2 Championship with a second podium finish in Bahrain today, leaving the 23-year-old at the heart of the title battle. 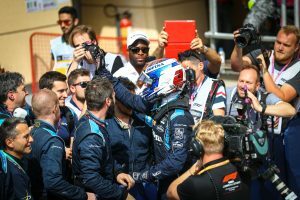 The Canadian stormed to victory in the Feature Race on Saturday meaning he took up eighth place on the grid for Sunday’s Sprint Race at the Sakhir International Circuit. 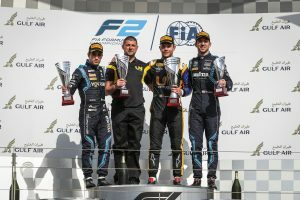 A strong start rewarded Latifi with third position on the opening lap and he was promoted to second when different strategies split the field. Latifi battled DAMS team-mate Sergio Sette Camara for the lead but ultimately stayed behind his opponent, and came home third once the differing pit strategies played out. “I tried to force Sergio into a mistake but he defended very well,” commented Latifi. “I settled for P3 at the end. I had a pace advantage for a few laps but it wasn’t easy to get by and I was wary of the tyre wear so I backed off. Saturday’s win and Sunday’s P3 have put Latifi second in the Drivers’ Championship on 35 points, just two shy of current leader Luca Ghiotto. “It’s a great start to the season for me and the team – Feature Race win, Sprint Race podium, and a good haul of points in the championship is just what I wanted,” he said. Latifi will be in action again in Bahrain next week when he takes to the wheel of ROKiT Williams Racing’s FW42 during the in-season rookie test, as part of his duties as Reserve Driver. It will be his first experience of the team’s 2019 Formula 1 car. “I’m looking forward to getting to drive this year’s Formula 1 car and gain some more experience in the championship,” he said. Round two of the F2 championship takes place in Baku, Azerbaijan from 26 – 28 April.